You won’t meet many lichen-watchers, with binoculars focused on tree trucks and rock faces. The Discovery Channel rarely profiled lichens alongside footage of lions and tigers stalking their prey. Most of us probably don’t remember the name of a single species of lichen. 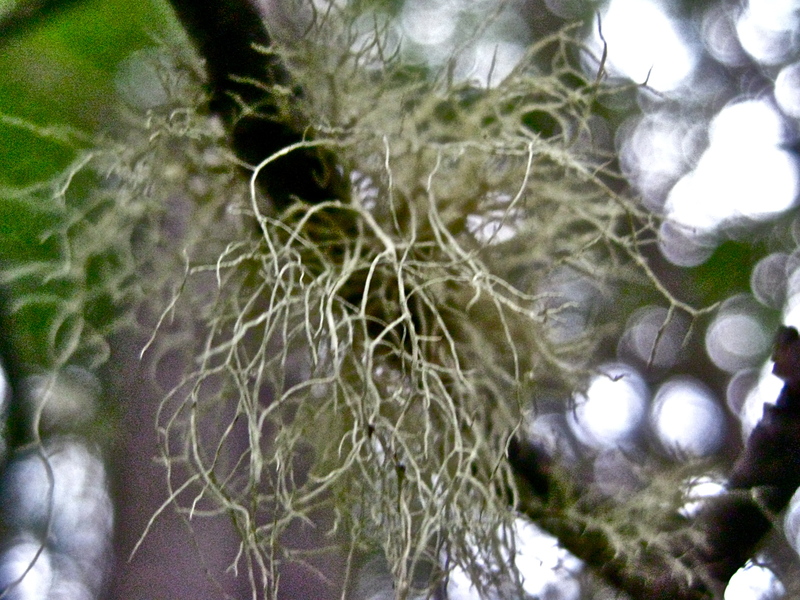 Nonetheless, lichens are some of the most unique organisms on the planet, and Old Man’s Beard (Usnea barbata) represents one of the most prevalent and characteristic species in Patagonian forest ecosystems. This name fits the lichen’s appearance—if the Old Man in question had a greenish tint to his tangled, tufted beard, and dangled his beard-hairs from every tree truck around. When walking through the forests of the future park, you see more beard than leaves. Some branches have so much lichen coating and hanging from them that the bark is scarcely visible. Curious about the relationship between Old Man’s Beard and the trees it grows on, we wrote to Rodolfo Gajardo, a leading Chilean biologist and member of our Scientific Advisory Board. He assured us that the lichen covering the tree trunks and branches do not harm the trees. Rather, the lichen increases the biodiversity that the forests can support, through adding another ecological niche in which other species can thrive. All lichens are products of a symbiotic association between a fungus and photosynthetic partner, usually an alga, which have evolved together to behave and look like an entirely new being, baring almost no resemblance to either a fungus or an alga. Usnea lichens, found all over the world, arise from a symbiosis between fungi from the Ascomycota phylum (often known as Sac fungi) and green alga of the Chlorophyta division. Although widespread, these lichens are highly sensitive to environmental disturbance, especially to air pollution such as sulfur dioxide. Recent studies in the Patagonia region have tested a potential scientific use of Old Man’s Beard as a biomonitor of air pollution in seemingly pristine environments. The researchers established a control site, testing the Old Man’s Beard found there for a wide range of chemical compounds. 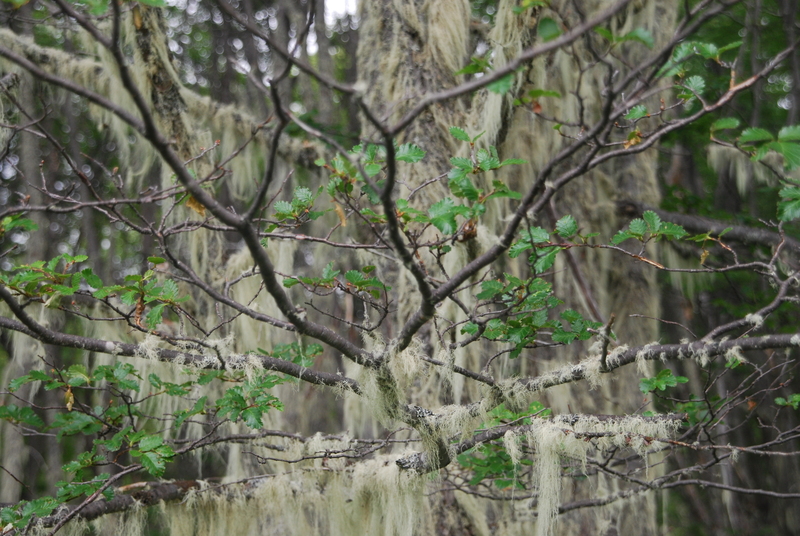 They transplanted lichens from the control site to over locations throughout Patagonia. After several years, they took samples of these lichens and conducted the same chemical tests as they had conduced several years earlier to gather data on air quality in these different locations. These studies demonstrated both that air pollution in Patagonia remains very low compared with other regions of the world and that this lichen can serve as a valuable indicator species. Because it has an exceptionally high sensitivity to airborne particles, it can offer a more detailed and precise record of air quality than simple atmospheric testing can achieve. This recent scientific use of Old Man’s Beard is just the latest chapter of a millennia-old history of human uses. Usnea lichens contain Usnic acid (C18H16O7), a potent antibiotic and antifungal agent. Combined with its hairlike texture, this meant that it lent itself well as a bandage and treatment for wounds in the years before sterile gauze and modern antibiotics. More recently, these antibiotic traits have led people to use Usnea to treat lung and upper respiratory tract infections, whooping cough, and dropsy. Moreover, the lichen is edible and high in vitamin C.
Excelente articulo!!! Preciso y con un gran contenido de información práctica. Me encantó la info! Ya lo creo que los líquenes son fascinantes y tan poco difundidos! Tengo una pregunta si es que pudieran responder.. entiendo que los líquenes más viejos son los que aparecen en las rocas cuando quedan expuestas (con el retroceso de un glaciar, por ejemplo). Ahora, en el caso del barba de viejo, sólo crecen en los árboles? Es decir que para pensar en una edad aproximada, el más antiguo de ellos es unos varios años posterior al surgimiento del árbol más viejo cuyo tronco todavía esté en condiciones para albergar un barba? (tronco de árbol vivo ó muerto). Osea que cualquier barba de viejo es mucho más joven que uno de esos líquenes de las piedras de los ambientes periglaciales? felicitaciones por tan interesante información,soy una persona interesada en todo lo referente a la naturaleza,en mi jardín tengo barbas de viejo”,e conseguido en distintos montes del territorio uruguayo,siempre que tengo oportunidad recorro lugares fantásticos y no salgo del asombro de las bellezas de la naturaleza,GRACIAS”atte.LUISA CEPEDA. En el mes de enero de este 2015 estuve en Neuquén, precisamente en Aluminé y alrededores. En el Lago Rucachoroy, en su margen oeste hay un lugar hermoso donde acampar. Una pequeña comunidad mapuche cuida esa margen del lago y desde ahí en una caminata de 2 horas cuesta arriba, se llega a una laguna, la laguna verde. Es una bellísima formación natural en la cima de un cerro enmarcada por bosque de araucarias, ñires y un intacto bosque nativo. De allí traje un puñado de este líquen y hoy 2 meses después sentí curiosidad por sus propiedades terapéuticas. Guardaré este manojo de pelos de viejo para un caso especial como un tesoro.